Home Your Health Resources Drugs, Procedures & Devices Over-the-counter Products Echinacea: What Should I Know About It? Echinacea is a flowering plant that grows in the U.S. and Canada. It is also called coneflower. It is a member of the daisy family of plants. Echinacea has been a popular herbal remedy for centuries. Today, it is often used to prevent or treat viruses that cause colds, sore throats, or the flu. You can find echinacea products in most drug stores or health food stores. It comes in teas, capsules, pills, liquid extracts, or dried herbs. It is one of the most popular herbs in the United States. Many people use echinacea as a dietary supplement for infections such as the common cold. They believe it stimulates the immune system. This helps the body do a better job fighting the infection. This can result in the sickness not lasting as long. Some people take it when they are well to prevent getting an infection. If you want to treat your cold or flu with echinacea, talk to your family doctor first. Also, make sure you do your research. The FDA does not have to approve dietary supplements before they are sold. In some supplements, the ingredients do not match what the label says. Find a company that quality tests its products. Then you will know you are taking the right thing. Read the package label carefully. Echinacea can come in many different strengths and dosages. It can also come mixed with other supplements. Follow the directions on the package. Only take the recommended dosage. Taking more than the recommended amount can be dangerous. Most brands say you should avoid taking echinacea on an empty stomach. They recommend taking it with food or a large glass of water. Don’t take echinacea for more than a few weeks. The long-term safety has not been studied thoroughly. Talk to your doctor before taking echinacea or other supplements. He or she can tell you if it will interfere with any other medicines you take. They can also recommend what dosage you should take. Store all herbal products out of reach and out of sight of young children. Keep them in a cool, dry place so they do not lose effectiveness. Do not store them in bathrooms, which get hot and humid. 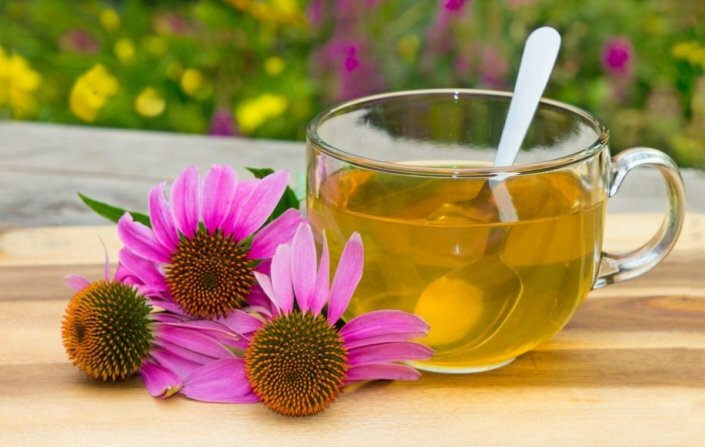 Many studies have been done on echinacea’s effect on the common cold. So far, researchers have not found conclusive evidence on its effectiveness. They don’t believe that taking it after you come down with a cold will shorten the time you are sick. Taking it when you are well may slightly reduce your chances of catching a cold. Echinacea can cause minor side effects. These can include an upset stomach, nausea, and dizziness. Serious side effects include allergic reactions such as rash, swelling, and difficulty breathing. It can also worsen asthma symptoms. Talk to your doctor right away about any side effects you are having. Some people are allergic to plants in the daisy family. These could include daisies, ragweed, marigolds, or chrysanthemums. This may put you at more risk of having an allergic reaction to echinacea. In addition, you should not take echinacea if you take immunosuppressants. It may interact with these medicines. Talk to your doctor before taking echinacea if any of the following apply to you. You take other medicines regularly or are being treated for a chronic condition. Echinacea may interact with other medicines. It could reduce their effectiveness or cause unwanted side effects. You drink alcohol, smoke, or use illegal drugs. These substances may affect the way echinacea works. Will echinacea help my cold? Is it safe for me to take it? What is the best dosage for me? What else can I do to ease my symptoms or shorten the duration of my cold? Learn about over-the-counter cough medicine for adults.